Kid Cudi Fire Jacket VI made from 100% genuine leather. A red stitch treatment is applied to the shoulders and inner arms of the otherwise black jackets. Lending itself to the important details, the collection features heavy-duty black gun-metal zippers and hardware as well as tonal metal snap buttons. A variety of diagonal and vertical pockets live on the front exterior shell of the jackets and the interior is fully lined for added comfort. This is truly a smoking hot piece! Black perforated leather bomber jacket with removable zipped sleeves. D&G bomber has a rib knit, striped shawl collar, a zip up front, two front flap pockets fastened with press studs, rub knit cuff and hem and one interior pocket. 70% lambskin, 30% nylon. Lining 100% nylon. Dry clean only. 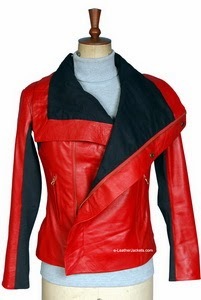 Women Leather Short jacket, V style neck collar. Front zip fastening. V style neck collar. Very attractive and new design plates on shoulder, cuff and hemp. Stitch design on back. Accessories 100% Cotton lining with two side zipper pockets and care labels. Lining used in the sleeve is 100% polyester. Back Cotton lining. Front thick zipper fastening, Round ribbed collar. single bone chest pocket on left side. Lower single bone cross pockets on each side. Rib with cuff. Stitch detail on back side. Accessories 100% Cotton lining with two side zipper pockets and care labels. Lining used in the sleeve is 100% polyester. Cotton back lining . Neck with hanger chain. Front zip fastening, lapel collar. Biker style. Adjustable cuff with hidden zip. Single cross zip chest pocket on left side. Applets on shoulder and belt with press stud. Accessories 100% Cotton lining with two side zipper pockets and care labels. Lining used in the sleeve is 100% polyester. Back Cotton lining. Front hidden zipper fastening with placket, sew buttons on placket. Double bone chest pocket on both side. Round collar with inside rib lining. Flap pockets with sew buttons and in seam pockets on each side. Rib Belt and cuff with sew buttons for. Double bone single hidden zipper pocket on left sleeve. Special stitching on back side. Accessories 100% Cotton lining with two side zipper pockets and care labels. Lining used in the sleeve is 100% polyester. Back Cotton lining. New to our collection, this cute athletic wear is made of high quality soft genuine leather. Front zip closure and full quilted lining inside. This leather hoodie jacket is great to wear in any chilly cold weather. 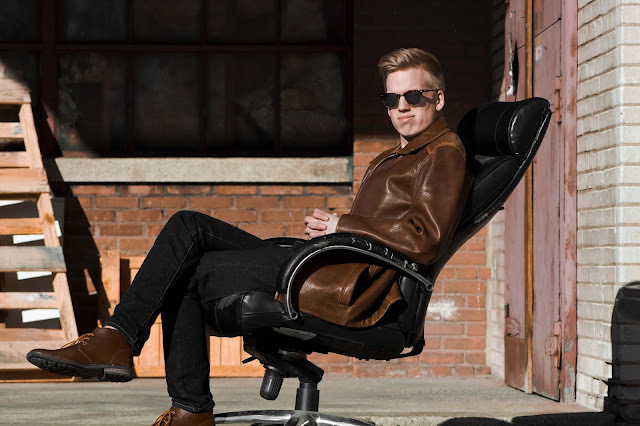 This engineered Kane jacket is a leather vintage jacket for men that‚s durable and warm enough for that ride around town. Comes in a classic, sophisticated cut that pairs well with your outfit for the evening. • Covered zip fastening with sew button. • Knitted rib to hem. • Stand collar with Knitted varsity-style collar. • 2 external zip pockets. • Vent detail to shoulder. • Fitted through the body. 4 Front Pockets with Zipper, Waist Belt with Buckle, Body Cotton Lining, Sleeve Polyester Lining. Stand out in this stunning, luxurious leather jacket from LeatherJacket4. It has a chic look with a stand collar design. This vibrant jacket is a go-to you will return to again and again - it'll mix perfectly with so many of your office staples! The edges with stitch detail increase more significant look in this feminine leather jacket. • All over seaming detail. • Sew button flap pockets. Genuine Lamb Leather, Color : RED Lining : 100% cotton body lining, 100% polyester sleeve lining, Tags : LeatherJacket4.com Original YKK Zippers, Metal button Cropped back Gilet with an asymmetrical concealed button placket and with a fitted paneled back detailing, finished with developed mock horn buttons with our branding. Double brace, hi-neck free collar with inner fleece lining, one chest in-seam pocket on left side, single lower cross double bone pockets on both sides. Round cuff. Stitching detail on back side. Inside vertical patch pockets on both side. Accessories 100% Cotton lining with two side zipper pockets and care labels. Lining used in the sleeve is 100% polyester. CR back lining . Neck with hanger chain. this jacket deliver in a week with free international shipping. Replica of Spider man jacket. White nylon thread stitch detail. Genuine Lamb Leather, cotton lining. Original YKK zipper. Kid cud i Fire Jacket VI made from 100% genuine leather. Lending itself to the important details, the collection features heavy-duty black gun-metal zippers and hardware as well as tonal metal snap buttons. 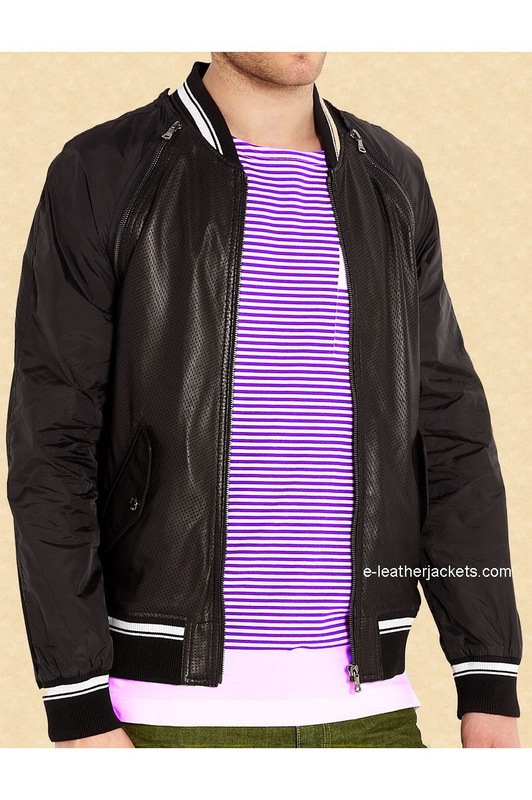 A variety of diagonal and vertical pockets live on the front exterior shell of the jackets and the interior is fully lined for added comfort.